Around-the-clock political news and analysis from Reuters. Follow @ReutersPolitics for more. Today is a week short of 50 years since JFK delivered his "Ich bin ein Berliner" speech on the steps of city hall "Rathaus Schöneberg." It's an election year here in Germany. 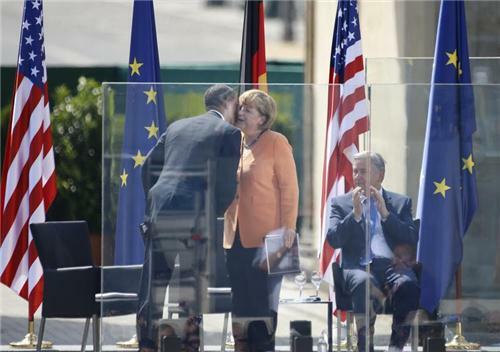 Obama visit is seen as good politics for Merkel. She wanted the public speech. 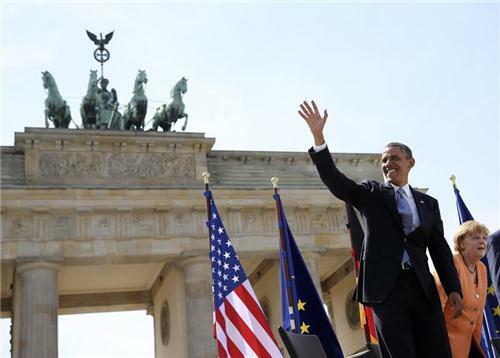 Obama: "'Ich bin ein Berliner' echoes through the ages. But that's not all [John F. Kennedy] said." BERLIN - President Barack Obama defended U.S. intelligence methods on a visit to Berlin on Wednesday, telling Chancellor Angela Merkel and wary Germans that Washington was not monitoring the emails of ordinary citizens or damaging civil liberties. Obama is popular in Germany but revelations before the trip that the United States has a covert Internet surveillance program, codenamed Prism, have caused outrage in a country where memories of the eavesdropping East German Stasi secret police are still fresh. WASHINGTON, June 24 (Reuters) - With some big rulings still left in its waning nine-month term, including two on gay marriage and one on voting rights, the U.S. Supreme Court said on Monday it would convene again on Tuesday to announce more opinions. Chief Justice John Roberts made the announcement after the nine-member court issued its opinions on Monday in five cases, leaving six more to be announced. Roberts did not say that Tuesday would be the last day of the term, leaving open the possibility of more sessions this week. The term begins on the first Monday of October, and the court traditionally recesses for the summer the last week of June. Julian Assange, the founder of anti-secrecy organization WikiLeaks, said on Monday that former U.S. spy agency contractor Edward Snowden was safe and healthy after fleeing to Moscow on his globe-crossing escape from U.S. prosecution. "The current status of Mr. Snowden and Harrison is that both are healthy and safe and they are in contact with their legal teams," Assange said, referring to Sarah Harrison, a WikiLeaks representative accompanying Snowden. "Edward Snowden left Hong Kong on June 23 bound for Ecuador via a safe pass through Russia and other states," Assange told reporters on a conference call from inside Ecuador's embassy in London, where he has been himself hiding from arrest and extradition. WikiLeaks founder Julian Assange said on Monday that fugitive U.S. spy agency contractor Edward Snowden had received refugee papers from the Ecuador government to secure him safe passage as he fled Hong Kong over the weekend. "In relation to Hong Kong, Mr Snowden was supplied with a refugee document of passage by the Ecuadorean government," Assange told reporters from inside the Ecuador embassy in London where he has been himself hiding from arrest for more than a year. Such papers did not necessarily mean that Snowden would be granted asylum in Ecuador, Assange said. Obama mentions first specific recommendation from his plan, will direct EPA to put an end to limitless dumping provisions (including carbon pollution into the air) for power plants, put in place new standards. Anticipating anti-regulation and conservative attacks against his plan, Obama cites the ingenuity and skill of American business that can be applied to the goals of his climate change plan. Says that those in opposition "lack faith" in the ability of business to act -- even asks whether Wal-Mart's recent commitments to sustainability would have happened if there wasn't a strong business foundation for this approach. On the Keystone Pipeline, Obama says that national interests will only be served by the project if it's executed with a focus on environmental impact. 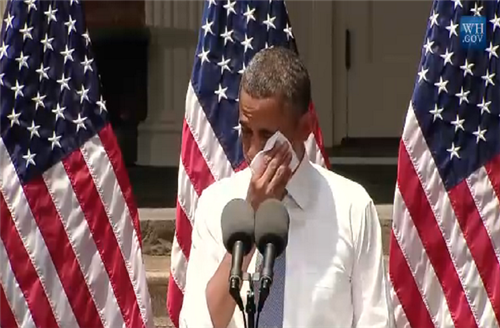 "We just can't drill our way out of the energy and climate challenge we face," says the president. WASHINGTON, June 25 (Reuters) - President Barack Obama said on Tuesday he is directing federal regulators to develop a plan to end the "limitless dumping of carbon pollution" from U.S. power plants. In a closely watched climate change speech, Obama said as part of a new national climate action plan, the Environmental Protection Agency will come up with new standards governing power plant carbon standards. Obama said he wants to see a market-based solution to climate, but that the problem demands attention now. He said there are no federal limits to the amount of carbon emissions that power plants can pump into the atmosphere. Obama transitions from ways to improve energy production and regulation to how Americans can use less and cleaner energy. He frames his clean energy push as a "race" with countries like Germany that are innovating in the field, making a point to mention that 75% of wind energy comes from Republican districts. Pres again calls on Congress to end tax breaks for big oil companies and fund clean energy firms instead. Obama couples his appeal to private Americans and businesses with one to the public sector: "Your federal government will consume 20% of its energy from renewable sources in the next seven years." Again referencing recent natural disasters and infrastructure concerns, Obama says that we must also prepare and account for environmental trends and challenges already entrenched. Calls on Congress to ensure that newly-funded projects are built to withstand disasters and stress. Final part of his plan, says the pres., is for America to lead international efforts to address climate change. Obama calls for an end of public financing of new coal plants overseas, unless they employ carbon capture technology or otherwise account for pollution standards. Thanks, Margarita. All eyes now turn to the House of Representatives, which will need to take up the Senate bill in order to send final legislation to President Obama to sign into law. Today, Speaker of the House John Boehner said that he would convene his conference after the July 4th recess, on or soon after July 10th. The House process is sure to be contentious, given the strong Republican majority (as opposed to the largely Democratic-supported Senate bill today by the majority there, though it did receive bipartisan support after careful negotiation). Boehner has said that the House's version of immigration reform should also be a bipartisan bill, but he also vowed to get majority Republican support, which may mean that the Senate bill is broken up to address the most controversial issues, particularly a pathway to citizenship, in piecemeal form. The process is likely to take on even more urgency as supporters look to finalize a bill before the August recess, with the town hall fiascos of healthcare reform four years ago strongly in mind. Reader note: we welcome you to submit your question or comment about today's immigration vote in the Senate. Readers, we're waiting on live streams from Austin to begin, we'll get going very soon. Readers, we're still seeing audio and quality issues on our only available live video above -- troubleshooting now, thanks for your patience. TX senate now debating what is "official legislative time." Clock on wall is 2 minutes slow. Getting nitty and gritty. This all relates to investigation over official time of vote last Tuesday. Who changed vote result from 6/26 to 6/25?? 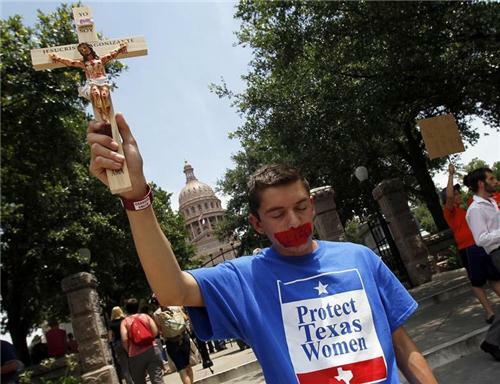 Reports out of Texas indicate that preparations for more statehouse-floor drama today were premature, as the House and Senate quickly moved through procedural motions and recessed until next week. The abortion-restrictions bill was referred to committee in both chambers, to be heard by next week in advance of any final vote, though more legislative maneuvering would not be surprising -- it's difficult to see the buildup/delay today as unrelated to the large crowds that gathered both outside the capitol and in the galleries, perhaps prepared for another dramatic showdown many lawmakers wanted to avoid. Lt. Gov. 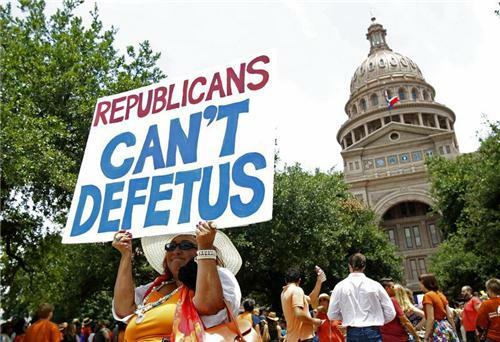 Dewhurst removed a potential obstacle for passage of the abortion-restrictions bill with his fellow Republicans by forgoing the traditional two-thirds rule in special sessions during the procedural flurry before today's recess. More background here. For lawmakers seeking more prominent offices, one advantage of a more drawn-out special session is the extra statewide and even national attention. Davis would probably be defeated in a statewide race. Opportunity could have picked a better time to knock. A strong party, good political infrastructure and money can cover a lot of candidate flaws. Both parties have won elections in Texas over the decades with standard-bearers possessing no discernable political skills. Likewise, lots of good candidates from both parties have fallen short because they were in the right place at the wrong time. Perry had signaled that he would make his decision about the 2014 governor’s race known by July 1. But that turned out to be the day the next 30-day special session will begin. Governors like to have as much leverage as possible when lawmakers are in session, and Perry may conclude that being a lame duck would reduce his influence. Most political observers believe Perry will step aside in coming days to clear the path for [Texas Attorney General Greg] Abbott, a close ally, but the farm boy from Haskell County has a long and colorful history of making unexpected political moves. So a re-election campaign for an unprecedented four-year fourth term can’t be ruled out. 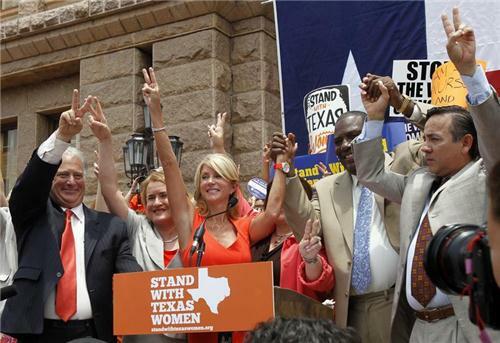 Might a Perry-Davis showdown in Texas make for an even more explosive electoral year in 2014? The next few weeks in Texas will likely be part of the answer. Readers: Thanks for joining us for our ongoing coverage of events in Austin, TX and all U.S. political happenings of note. Please keep up with the latest using the Twitter and stream links above, and we hope you'll be back again soon.